Sadly, as we enter into the thrall of Winter we begin to lose one of the most striking, and easily identifiable, constellations from our North Western sky: Orion. He is, after all, our summer constellation and so he flees behind the Western horizon reasonably early on in the evening and will almost completely disappear from our night skies by the end of the month. Most recognize him by his ‘belt’ of 3 bright stars in a row – which is incidentally almost the exact translation of its Maori name: Tautoru. Take solace though as Orion will reappear in our morning sky later in the year and features prominently in Matariki celebrations as Tautoru takes its role as one of the ‘Pillars of Light’ separating Ranginui from Paptuanuku – but more on this later! 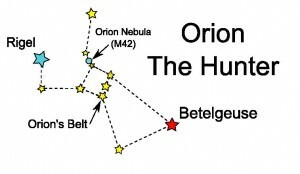 Orion’s Belt is a great way to navigate and memorize his part of the sky. On either side of it sit two bright stars: one sporting a brilliant blue hue, called Rigel, (Orion’s ankle) with special significance to many Iwi as its rising later in the year can mark the beginning of the traditional new year, instead of Matariki. 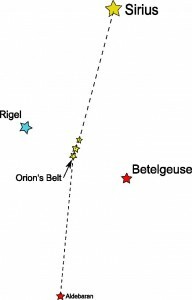 The other is a deep luscious red, by the name of Betelgeuse, affectionately known as ‘Orion’s Armpit’. Following the 3 stars in the belt out in one direction leads you to ‘Sirius‘, the brightest star in our night sky. Sirus is the main star in the constellation of Canis Major, Orion’s large hunting dog. Following the line the other way will point you to medium brightness Red star: Aldebaran (NOT Alderaan which is a mistake I keep making! ), the main star in the constellation of Taurus, one of the signs of the Zodiac. This brilliant red star is Taurus’ ‘eye’. Just to the side of Aldebaran (the Rigel side) is a group of fainter stars shaped like a sideways “V”. This is the famous Hyades, a gorgeous star cluster roughly 150 light years away from earth. The Hyades mark the ‘face’ of Taurus – then his horns extend out ‘below’ [at the moment] Orion into two bright stars. These stars aren’t particularly notable themselves (well, you know APART from being giant balls of gas casually fusing elements together, one being 5,700 times brighter than the sun), but next to the top horn (the one closest to Orion) is the Crab Nebula (a.k.a. M1). The entire point of this post was actually so I could just use this image as it’s one of my favourites! 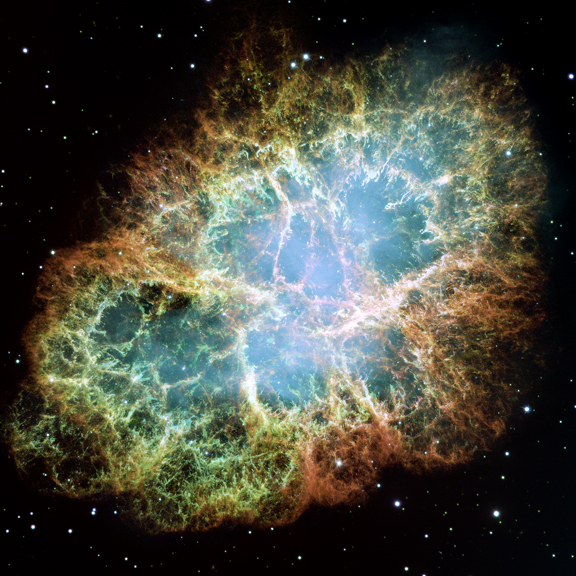 M1, is the remains of a supernova, the explosion of a massive star at the end of its life due to the gravitational collapse made possible by the star running out of fuel and losing the ‘Radiation Pressure‘ it requires to remain stable. Personally, I just call it pretty damn spectacular!